The home of the World’s Columbian Exposition, the University of Chicago and former President Barack Obama, Chicago’s Hyde Park neighborhood is brimming with history and culture. Because of its location, Hyde Park is relatively tourist-free, making it a great place to take a break from the bustling crowds. From a bookstore you can get lost in to world-class museums, there’s plenty of fun to be had in Hyde Park. Here’s the top 9 things to do in Hyde Park. The Robie House was designed by famed architect Frank Lloyd Wright and is considered the best examples of the Prairie School architectural style in the world. Every element in the house, from the textiles to the art-glass windows, was designed by Wright. There are tours of the 100-year-old house Thursday to Monday, 10:30 a.m.–3 p.m. Admission is $18 for adults; $15 for students, seniors and military personnel; and free for children under 3. Powell’s Books Chicago, related to Oregon’s Powell’s Books, has been selling and reselling books since 1970. The store specializes in academic books, but they also have plenty of general interest books, alongside out-of-print and antique texts. Knowledgeable staff can guide you through the massive collection, or you can browse on your own. Promontory Point is a manmade peninsula in Lake Michigan first opened to the public in 1937. The Point spans 12 acres and has beautiful views of downtown Chicago. There are plenty of stone-lined fire pits if you want to have a nighttime bonfire. Visitors can stretch out on the grass or walk down the large, limestone steps and, carefully, splash in the water. Be warned! The Point does not have a lifeguard on duty so you swim at your own risk. Art galleries, museums, chapels: The University of Chicago campus has it all. The campus stretches across the Hyde Park and Woodlawn neighborhoods and is split into north and south sections by the Midway Plaisance, a park created for the 1893 World’s Expo. There are several museums on campus and the gothic architecture makes for a picturesque walk. Housed in the former Palace of Fine Art from the 1893 World’s Columbian Exposition, the Museum of Science & Industry has been open for business since 1933. The sprawling museum houses more than 2,000 exhibits including a recreation of a deep-shaft coal mine. If you get hungry while perusing the 75 exhibit halls, fear not, there’s a sizeable food court in the museum’s lower level. Once you’ve gotten your fill of science, check out the pond and prairie behind the museum. Entry costs $21.95 for adults and $12.95 for children ages 3–11. Special experiences, like the Coal Mine, and visiting exhibitions are an additional fee. Just across Lake Shore Drive from MSI-Chicago is 57th Street Beach. South side beaches tend to be less crowded than their downtown and North Side counter parts, so you’ll have no trouble finding a spot on the sand here. 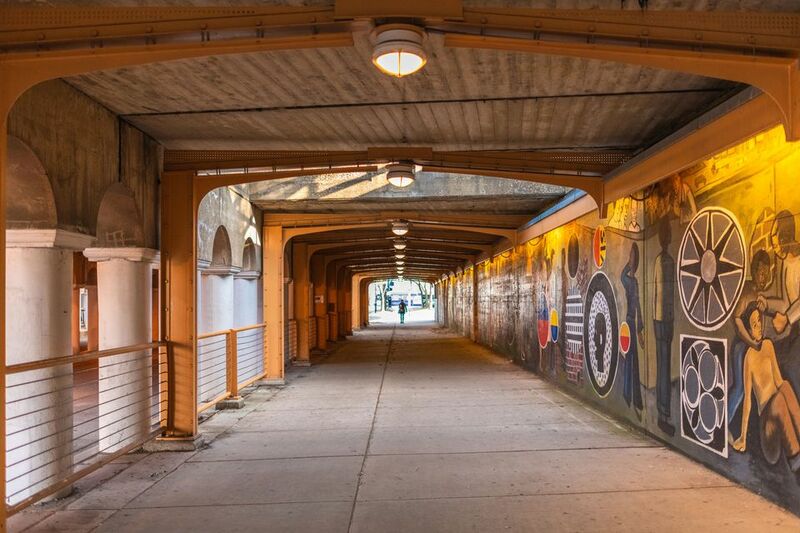 The beach is also on the Lakefront trail which goes as far north as Navy Pier and as far south as the South Shore Cultural Center on 71st Street. After soaking up some sun, be sure to take a walk on the trail where you’ll have beautiful view of the lake and spot some art installations. The DuSable Museum of African American History is named after Jean Baptiste Point DuSable, a Haitian man who established the trading post that would become Chicago. Founded in 1961 the museum holds more than 15,000 pieces of art and memorabilia that center on the experiences and accomplishments of people of African descent. Admission is $10 for adults, $7 for students and seniors, $3 for children ages 6-11, and free for children under 5. Medici bakery sells freshly baked cinnamon-raisin croissant rolls and croissants—plain and filled with delights like chocolate or ham and Swiss cheese—along with freshly made sandwiches, coffee and ice cream. When the weather is nice, the large glass windows are removed and the small store front is transformed into an open air café where you can sip your coffee and get in some people watch. If you’re in the mood for a more substantial meal the Medici Restaurant is two doors to the left and serves breakfast, lunch and dinner. Be sure to stop and have breakfast at former President Barack Obama’s favorite diner, Valois’ Restaurant. Service moves quickly as meals are cooked to order right in front of your eyes. Breakfast is served from 5:30 a.m.-4:00 p.m. with a rotating cast of daily specials, but there are no bad choices here, just be sure to have enough cash on hand. The décor is sparse, with the exception of several wall-sized murals of Chicago, including one ensconced in the ceiling!